How Chinese, French, German, Indian, Israeli and other foreign born entrepreneurs contributed to high tech innovation in the Silicon Valley, the US and Overseas. Book: They Made It! 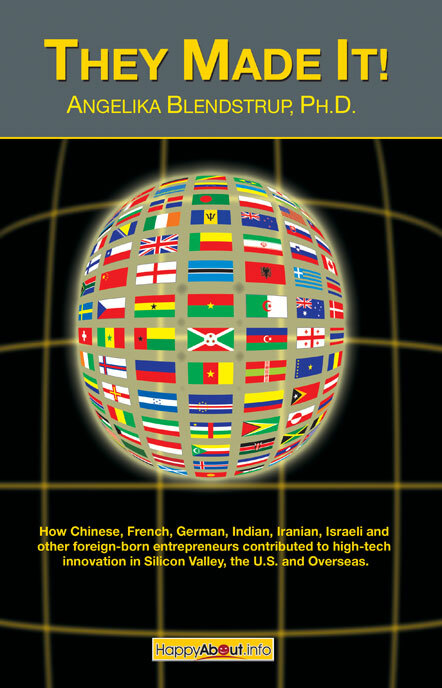 : How Chinese, French, German, Indian, Iranian, Israeli and other foreign born entrepreneurs contributed to high tech innovation in the Silicon Valley, the US and Overseas. Great leaders have been the stuff of many business books over the years with authors often promising to deliver THE key ingredients that can guarantee the readers success in their own careers. As we all know by now, there is no "secret sauce." But there are a number of "recipes for success" with specific ingredients that if applied, may smooth the path upward. These recipes are the result of conversations with foreign-born (as well as US) Silicon Valley/US entrepreneurs who tell it as it is. Each leader tells a unique, personal story of how s/he came to the US and ultimately made it. If you plan to immigrate to the U.S. and establish yourself in Silicon Valley, or if you are just curious to find out what make these extraordinary individuals tick, you can listen to these foreign-born professionals and gain personal insight into the fulfillment of their ambitions and dreams. To hear the individual voices speak about their own development - what did they have to face, what obstacles did they overcome? Readers of this book will benefit from seeing the personal side of these Silicon Valley/US/Overseas executives interviewed and by getting insight into how they live and how they got to where they are today. Many inspiring stories will motivate you to emulate those interviewed for the book. 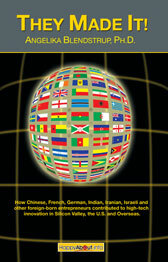 Additionally, there are lessons learned, 12 Recipes for Success and policy implications based on the status of H1-B visas, the employment of foreign-born professionals and the potential for missing out on attracting future leaders from abroad. How Chinese, French, German, Indian, Iranian, Israeli and Other Foreign-Born Entrepreneurs Contributed to High-Tech Innovation in Silicon Valley, teh U.S. and Overseas. "Immigrants from Andy Grove, to Vinod Khosla, to Sergey Brin have made Silicon Valley the extraordinary success it is today. This book provides valuable lessons learned from the successful entrepreneurs that will prove inspiring to people from every country." "If you are looking for the high road to success in business and in life...if you are fascinated by the Silicon Valley dream and the stories of people who have shaped it, you have found a unique guide with Angelika Blendstrup's new book. This book will help you stand on the shoulders of giants and remind you when you need it that anything is possible, that you can change the world and truly achieve your dreams." "This is a wonderfully crafted book that illustrates the entrepreneurial spirit of America in general, and Silicon Valley in particular. Angelika's personal story, together with the inspirational tales of those interviewed, strikes a chord with all generations and communities, collectively pursuing the American Dream." "Many Europeans come to Silicon Valley drawn by the possibility of realizing their dreams and creating their own start-ups. The stories in this book by the international entrepreneurs of the Valley are a valuable resource and will give these newly arrived business men and women insights they might not have received otherwise." "A fascinating book! Dr. Angelika Blendstrup has put together an accomplished and valuable composition on immigrants, their success and faith in progress. Her book portrays the American dream magnificently, or better said: the Silicon Valley dream." "Reading this book, I really got the sense of what some of these successful entrepreneurs went through. The greatest lesson is that most were able to rise to such great heights out of such ordinary beginnings. There wasnt any magic other than a desire to move forward toward a vision, and the willingness to work at it. This book will bring greatness to you because you can see doing it yourself  i.e., changing the world is really not that unreachable after all  and that, IMHO, is the greatest take-away out of reading this book." "Les experiences vecues ainsi decrites dans ce recueil d'interviews permettent de vraiment toucher du doigt le magique ecosystem de la Silicon Valley"
Also watch Part 2 and Part 3 of the video. "My passion in life, if you will, is to simply build better products." "Humanity and the planet, we're all one and there are different shades and different grades and we need to listen to that." "As we say in Silicon Valley, you have to learn not to drink your own Cool Aid." "Life and management are about conflict. When you become a CEO, the key to being successful is actually to pick up what's the right decision, not to be right." "My father certainly instilled in me spirit: "Don't be afraid of anybody, and don't take crap from anybody." My father was a real maverick. " "The key word to everyone here is the process. Enjoy the journey." "I'm a believer of chance, it favors the prepared mind. If you are prepared, you perhaps are better equipped to capture and to capitalize on some of the opportunities ahead of you." "The biggest thing is- you have to have the passion to follow your dream and you have to have the determination to convert that into something tangible." "Because life is not just spice and curry, you know. There are other things, so keep an open mind." "If there's anything that I have seen change in my life, it's that victory goes not to people who are right or who are the smartest, but to people who realize that the world is changing very rapidly, and the winners have to get there first." "The biggest challenge, to be quite honest with you, was getting the Internet into operation." Angelika Blendstrup, Ph.D., is the founder and principal of Blendstrup & Associates. She specializes in individualized, intercultural business communication training, accent reduction and presentation skill coaching. She works with international as well as US executives to assist them in improving their written and oral communications skills, and prepares them how to write and give effective presentations. Angelika holds a Ph.D. in Bilingual, Bicultural Education from Stanford University. She speaks five languages and has taught US business communications skills to international executives both privately as well as in companies in the Silicon Valley such as DreamWorks, Sun Microsystems, Microsoft, Oracle and Cisco. Angelika teaches classes at Stanford University on topics such as cross cultural communication, managing virtual teams and the art of interviewing successfully.